Pit Boss Austin XL Pellet Grill Review: Over Hyped But Still Great! The Austin XL is the latest pellet grill launched by Pit Boss that is designed to CRUSH Traeger. They may have finally done it. The Pit Boss Austin XL looks beautiful, has a lot of space and is value priced. Here is the marketing video that Pit Boss put together for the Austin. Take two minutes to watch the video and then we can talk about what is real, what is hype and whether or not this is the right pellet grill for you. Okay, lets talk about some of the numbers that are used to describe this grill. 1000 Square Inches of Grilling Space: Well, not really. The primary cooking grate actually has 649 square inches of space. The secondary elevated rack has 288 square inches of space. Combine both of them and you get 937 square inches. I realize that everyone uses their grill differently but I hardly ever use the smaller elevated cook racks or “warming trays” in any grill that I ever owned. They usually get in the way and I end up taking them out. If you work your grill like I do then you are going to be working with 649 square inches and not 1000. This is still a mighty big grill but not quite as large as you might think. 200 Pounds of Solid Construction: Well, not exactly. The assembled weight of the Austin is 183 pounds. The 17 pound difference doesn’t really matter except to point out that Pit Boss isn’t afraid to get creative in what they are telling you. Pit Boss uses the 200 pound number as an introduction to their marketing literature which says, “With heavy-duty steel construction, Pit Boss grills are built to last.” The problem is that the phrase “built to last” is pretty vague. In reality the Austin comes with a one year warranty. 2019 Update: As of September 2018 Pit Boss improved the warranty on all of their pellet smokers to 5 years. This is a serious improvement that makes the smokers a serious player in the market! The Owner’s Manual for this grill goes on to say, “The Pit Boss, because of its single wall construction, should be considered as a 2 to 3 season grill, depending upon where you live.” You can take this phrase to mean that the grill will only last 2-3 grilling seasons OR that it will only be able to be used for 2-3 seasons of the year. Either way, this doesn’t really support the “heavy-duty steel construction” claim. I keep a running list of the Best Pellet Grills for the Money and I don’t include the Pit Boss products for this very reason. They grills work great out of the box but I just have no idea if they are going to last or not. Two other features that don’t quite live up to the hype are the Flame Broiler and LED digital controller. The Flame Broiler is a series of slits in the heat shield that sits directly over the fire pot. The slits can be covered by a second heat shield if you don’t want your meat to have direct access to the flames. The problem with the Flame Broiler is that the fire pot is not very big. Here is a peek at what I am talking about. The fire pot is big enough to heat the grill just fine but the “Searing and Broiling” area directly over the pot is small. You will probably be able to flame broil two or MAYBE three strip steaks at a time. The LED Digital Controller works okay but not nearly as good as the controllers found on Camp Chef, Traeger, Green Mountain or Rec Tec pellet grills. The Pit Boss controller will hold you at an AVERAGE temperature just fine but it will routinely swing and spike by at least 20 degrees F in either direction. Other brands have been able to cut the temperature swings down to 5 degrees F.
I know this review of the Austin XL has highlighted all that is wrong with this grill. I am NOT a hater of this grill. I really actually like it and think a bunch of other folks will too. I am highlighting the negatives because Pit Boss is already doing a fine job of showing you what is great about the grill and I think they might be tooting their own horn just a little too loud. If you still want to get the Austin XL (and at this price point I wouldn’t blame you) then at least you already know the positives and negatives and are going in with your eyes open. If you really like the Pit Boss brand then you might also want to take a look at their other new release, the Copperhead Vertical Pellet Smoker. The Pit Boss smokers are designed to be an affordable entry point for folks wanting to get started with a pellet grill. While I appreciate how affordable they are I will always suggest that you pay a little more and get a higher quality product. Before you buy a Pit Boss you owe it to yourself to look at the Camp Chef pellet grills. The Camp Chef pellet grills cost a little more but have better temperature control, an easy to use ash removal system and come with a three year warranty. Some of the Camp Chef products come with a propane fired infrared sear station. The Sear Station is a side burner that can reach temperatures of 900 F and is the BOMB for searing steaks. The general idea is that you can smoke a steak at low temperature inside the smoker and when it reaches about 115F internal then you take it out of the smoker and sear the exterior on the Sear Station. Smoke Pro DLX PG24: Smaller than the Austin (570 sq in vs 649 sq in) but just about the same price. Woodwind with Sear Box: Smaller than the Austin (570 sq in vs 649 sq in) but comes with the propane fired infrared sear station burner. Knowing the difference in a smoker and a grill, is there such a thing as a pellet smoker? I am talking about the heat NOT being directly UNDER the meat! 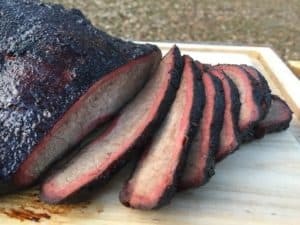 Is there an Offset Barrel Smoker that uses pellets and automatic temperature control? EVERY “Pellet Smoker” I have found is actually a grill. I thought a smoker used indirect heat, not directly under the meat as a grill does. Martin, I am unaware of any offset pellet smokers. That being said, there are over a million owners of Weber Smokey Mountain Cookers, Big Green Eggs and Ugly Drum Smokers who will argue that having the heat directly under the meat is a great smoker design that makes amazing barbecue. I will suggest that if the cooker can go low and slow with indirect heat then it has the potential to be a great smoker.